So here I am – day 1 of being unemployed! (I quit my fulltime corporate job and my last day was Friday. Check out my IG Post for some background. My hubby did the same!) I am still recovering from a weekend of awesome company but WAY too much food. My girlfriend’s baby shower was centred around a high-tea theme with all-you-can-eat desserts. It was incredible but OMG – the face tingle from all that sugar! What followed was another girlfriend’s birthday BUFFET dinner! As much as I practice and preach moderation, eating slowly, and portion control, eating more than I normally do was inevitable yesterday and it was in an abundance of animal proteins and sugar. So today, the hubby and I, although very thankful for the good times had with the weekend festivities, are taking it a bit easier on our digestive systems with some home made vegetable and bean soup! 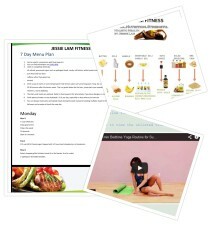 Here’s what we’re eating as part of our Meatless Monday lunch and dinner meals! Wash your veggies in vinegar or sea salt and juice from a lemon. Rinse 1-2 more times. Bring the pot of water to a boil and add organic carrot peels, sliced carrots, onions, and celery. 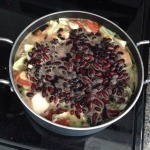 Simmer for about 10 minutes and add the rest of the vegetables – tomatoes, cabbage,mushrooms, and then the beans. Simmer for another 10 minutes or up to an hour if you want more of a broth and softer beans. Notice how I used no oil and did not sautee any garlic or onions before adding water. This is typically how my Chinese parents and grand parents prepare soups – sometimes simmering for hours. It ends up more like a broth but the vegetables and whatever else you put in the soup is completely edible and delicious and you can add salt, pepper and other spices to taste! Super clean and practically from the garden! 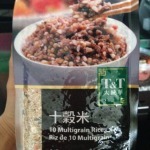 The hubby and I enjoyed this with some 10 grain rice from T&T. Hope you like it! As always, please feel free to leave a comment with feedback, suggestions, and requests!